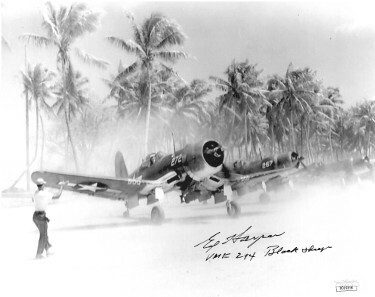 In August, 1943, a group of twenty-seven young men under the leadership of Maj. Gregory “Pappy” Boyington was joined together to form the original Black Sheep Sqn. of VMF-214. The Black Sheep produced eight fighter Aces flying against the Japanese, and the Sqn earned the Presidential Unit Citation for extraordinary heroism in action. Edwin "Ed" Harper has hand signed this Vintage B&W 8x10 Photo with VMF 214 Black Sheep Squadron inscription. JSA Hologram #DD39256 and Certificate of Authenticity.